Although West Africa has no monuments comparable to the Pyramids and Temples of Ancient Egypt or the ruins of Zimbabwe, it has in the stone circles of the Senegal and the Gambia impressive remains that have puzzled the few travellers who have examined them. Stone circles of many types are found throughout Europe and the Near East, though nowhere is there so large a concentration as found on the north bank of the river Gambia. It is fair to assume that the presence of such a large groupe of monuments of a similar type in a relatively localised setting implies the presence of a well established, dynamic culture. The question remains: Who? The area involved covers some 15,000 square miles between the Saloum and Gambia Rivers. Here there are hundreds of circles containing many curious features and in particular the unique V or Lyre stones. The commonest shape is round like a pillar with a flat top. Others are square; some taper upwards. There are small stones with a cup-shaped hollow on top. Others have a ball cut in the round top of the stone. There is a recumbent stone shaped like a pillow. 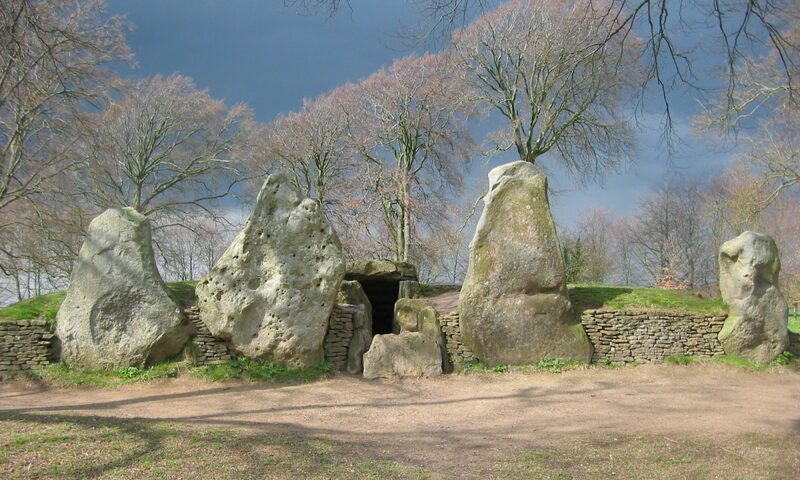 The Circles are composed of standing stones between ten and twenty four in any particular circle. One of the striking feature is that almost all the stones forming a given circle are of the same height and size. Their height above the ground varying between two hundred and forty five (245cm) centimeters and sixty centimeters (60cm). The diameter is from thirty centimeters (30cm) to one hundred centimeters (100cm). The largest stones which are at N’jai Kunda must weigh about ten tons each. They were brought down a steep hillside and their transportation on rollers or on hammocks must have presented formidable difficulties and have required a considerable labour force. As a results of Laboratory tests at the University of Dakar, the date of the sample was found to be from 750 A.D plus or minus 110 years. The stones were cut out of laterite (“a cementation of ferruginous sandstone”) that occurs in large outcrops in this region. It is a feature of this stone that it hardens upon exposure to the air, and that prior to such exposure it is relatively easy to quarry. Where several circles are found on the same site the exterior stones form a continuous line as at Wassu. A lot of explanations have been given about the shape of the Senegambia Stone Circles by Islamic historians and wise observers. One of such explanations was revealed by the late Alhaji Kemoring Jaiteh a well known Islamic scholar of Kuntaur Fulla Kunda in Niani. According to his writings, if a small stone stands near a large one, that shows that, some one was buried with his/her child. Similarly, if the stones are V-shape, that pictures that two close relatives died on the same day and were buried together. The circles are said to be built around mounds of kings and chiefs, in the same way as royal persons were buried in the ancient empire of Ghana. Once Islam was brought into Senegambia in the 11th century, devout Muslims especially the “Karamos” were also buried in the same way. Consequently, some of these Circles became holy places. Today, small stones and vegetables like tomatoes are still left on the stones. Some of these stones are said to shine bright at night. The Wasu Stone Circles are said to be visited by hundreds of people annually and all-year-around and by classes of people: students, geologists, historians, archeologists and tourists. A new museum situated at the “Stone Circles” in Wassu Central River Division was inaugurated on Saturday May 27th 2000. According to a press release issued by the National Council for Arts and Culture, the museum is the first of its kind in the Senegambia region which seeks to interpret the “Stone Circle” puzzle. The Wassu museum is seen as a major success for the Council in its drive to decentralise its services and preserve the Gambia’s cultural heritage. The release says that work on the building was completed through the financial assistance from UNESCO and technical support from APSO, an Irish Voluntary Organisation. Momodou Camara is from Niani in the Central River Division of The Gambia West Africa. The ethnicity of this area of The Gambia, as in other parts, is very diverse i.e. Mandinka, Fula and the Wollof tribes predominate with other minority tribes such as Mansuanka, Balanta, Manjago, Jola etc. All living together with mutual understanding and respect for each other’s traditional norms and values. Islam and Christianity are the main religions in this area. The main economic activity is farming; a wide range of crops such as peanuts, millet, sorghum, rice, maize, potatoes, sesame etc are cultivated.